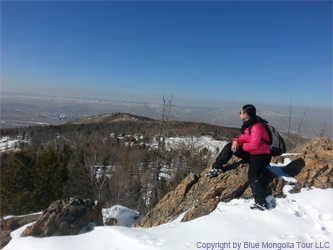 Bogd Khan national park is located in south of Ulaanbaatar city. 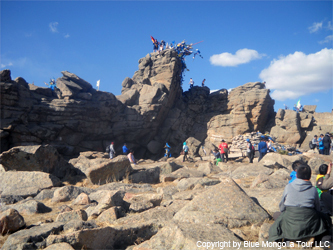 The Bogd Khan Mountain, along with Mongolia's other sacred mountains Burkhan Khaldun and Otgontenger, was added to the UNESCO World Heritage Tentative List on August 6, 1996 in the Cultural category. World Heritage sites are those that exhibit universal natural or cultural significance, or both. In 1778 the Mongolian governor (minister) of Khuree (Urga, present day Ulaanbaatar) Sanzaidorj sent a letter to the Qianlong Emperor, Manju's Ching Dynasty, requesting approval of annual ceremonies dedicated to Mount Bogd Khan Uul. The Mongolian letter and the reply from Beijing in Mongolian is kept in the Central State Archives of Mongolia. The Mongolian letter said: "This mountain is called Khan Uul because Genghis Khan had lived here originally. Indeed the many princes, dukes, banner governors, saints and disciples of the Khalkha all regard this mountain as marvelous and the former old Khutugtu (Zanabazar) himself worshipped it. Until now the many locals here never hunt the animals of the mountain as if they were entitled to hunt them, nor do they move the trees as if they had the right to do so. ........... Pronounced earnestly for this reason, we beg Royal Decree." The reply letter meaning is "have accepted your request. Please, Make this mountain protected sacred area and keep the ceremony for this mountains". That is why this mountain is officially declared first protected area, , on the world. Manzushir monastery was housed by 400 monks and religious ceremony held by over than 1000 lamas. The monastery was renowned throughout Mongolia for its religious service and its celebrations of Tsam /religious dance/. In 1700-1800 the monastery consists of 14-17 halls, artificial lake in front of what was the main temple. In 1937 communist purges all of the halls were destroyed down completely. Later in 1990, after the communism collapse, several years' restoration work has brought some of the buildings back to life. Rocks engraved with Buddhist images are located in lovely hills near the temple ruins. One represents the Zonkhov /1357-1419/, founder of the Gelugpa school of Tibetan Buddhism , and second shows the Bodisatha, considered the patron of the Manchu. A third rock is engraved with a design of an elephant, hare, monkey and bird, which known as the allegory of cooperation. A small museum of flora and fauna was built in 1972 neighboring to the temple ruins. The museum exhibits the model of the original temple, as well as small skillfully done images from natural elements: wood, sand, feathers, stones and fur.Open air archaeological remains at the side include the large cauldron, 2 m wide and 1 m tall, with inscriptions in old Mongolian script. One of the incriptions dates to the cauldron to the summer of 1730. Another explains that it was used to boil water for tea. Also there is a large bell /1m height/ dates to reign of the Manchu emperor. There are tent design and Mongolian Ger museum, which is completely fitted with Mongolian national furniture.